You can update your account details from the Edit My Details page. To change your password simply enter your existing password and a new password and click the "Update Password" button. If you have forgotten your existing password, you can reset it using this page. A password reset link will then be sent to your email address. To change other details such as your email address, communication preferences, country, default paper and default starting settings for new worksheets, make the relevant changes under "Change My Details" and click the "Update my Details" button. Quickworksheets uses a service called Gravatar to generate your avatar - the little picture in the circle that represents your account. Gravatar is used by many other sites and blogs around the web. You can change your default avatar by clicking on the various options under "Change My Avatar". 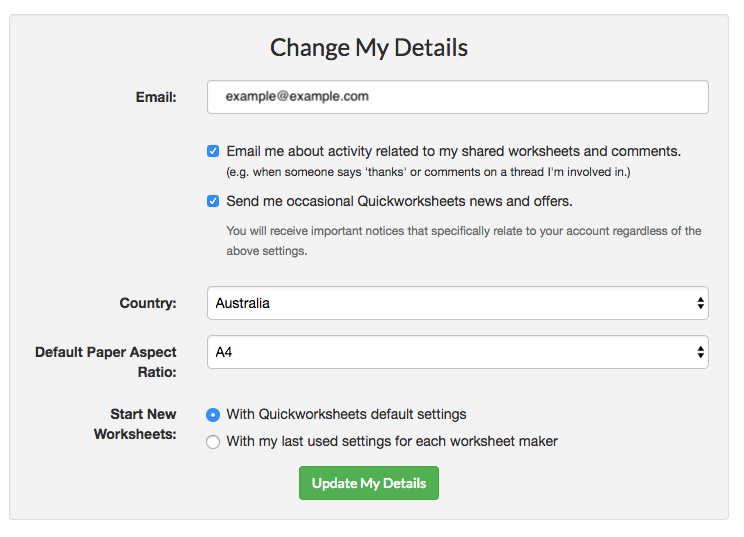 If you want to set a custom avatar you can do so by signing up with Gravatar/Wordpress.com using the same email address that is associated with your Quickworksheets account and uploading a picture to the Gravatar service.